You can now get a bowl of laksa in Aiea. Laksa is a popular spicy noodle soup with a coconut milk curry base. 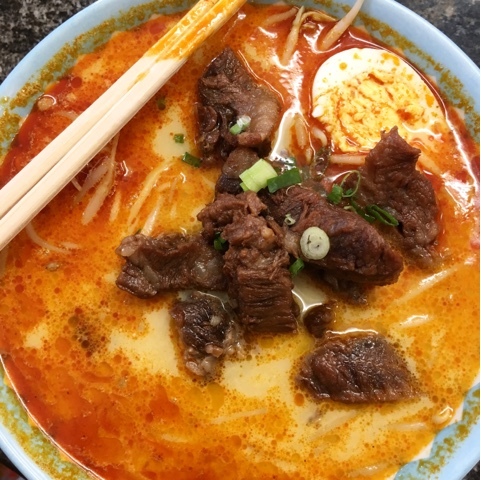 I recently had a bowl of the beef brisket laksa from Papa's Tea House, a restaurant located in Aiea Town Square next to Golden Wheel Chinese restaurant. The laksa was very spicy and overall I enjoyed it, but the beef was a little too fatty and the coconut milk was a little too rich for me. My friends enjoyed the deluxe combo which got them 2 scoops rice, 2 crab puffs and garlic chicken for $6.25. That plate was huge! A real deal and they loved it. Next time I want to try their spicy ahi don. If variety is what you are looking for, then Papa's Tea House will not disappoint. They offer a variety of menu items from laksas and saimins to bentos and sushi. They even serve boba drinks and you can put in a cake order while you are at it. Open daily from 10am to 9pm and 10am to 2:30pm on Sundays.